A £50 million solar fund has been launched in the UK aiming to attract pension and charity investors. 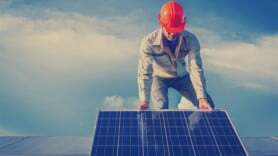 Launched by Goldfield Partners, the Solar Green Fund provides investors with the opportunity to enter into a limited partnership which will purchase a range of installed solar assets in the UK. Each investor is expected to get a return of between 6-8% every year through Feed-in Tariff payments. The fund is expected to benefit local communities and help tackle fuel poverty. The majority of the solar panels are already installed and fully operational on both private and housing association domestic properties in the UK.